This app demonstrates the use of a custom form component in a basic log in application. The app contains three views: a login form, a registration form, and a user profile form that displays the information entered during registration. These forms are built using a custom form component, which is defined at the end of the program. The form component allows for the concise definition of forms by defining common behavior like form submission and resetting. The app contains the current page, as well as the current user. Initially, though, there is no user, so we just need to specify the current page. 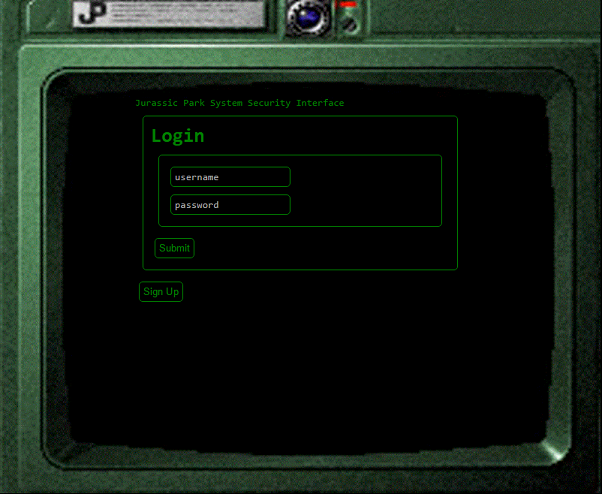 The log in form contains two input boxes, one for the username and another for a password. We must explicitly sort the fields (using a sort attribute) to display them in a specific order. A successful login is one where the username and password entered in the login form match some user/password combination stored in the system. For simplicity, passwords are stored as plain text, so we just need to search for a #user with a matching username and password. If one is found, we set it as the user attribute in the #app record. If the user enters a login that does not match a user, then display a message indicating that the login failed. form-message.text := "** Login Failed **"
The user registration page requests the name, department, a username and password. We need to create a #user from the submission of the registration form. This will only work if every field has an entry, and the two password fields match. The profile page displays information relating to the current user profile. It is accessed after a successful submission of the login form, which creates a user attribute in the #app. Clicking logout returns to the login page, and removes the user from #app. We can specify custom behavior by special casing search conditions and adding new side effects. In this block, we hijack the login process when the username is “dnedry”. Instead of displaying the typical “login failed” message, we give the user a surprise. Forms have a title and one or more sections. Each section has an optional name, and contains one or more fields. Each field additionally has the input type of that field (input, radio button, drop down list, etc.). A form starts as a #form record. Display each section. To properly display sections, we need to add them to the children of the form. Display the fields in each section. As we did with sections, to display fields we need to move them over to the children of the section display. Form values are saved as a #submission when the submit button is clicked. This submission has a lifetime equal to that of the #click, so a submission must be committed to a record by the user. This allows the user to implement custom handling logic. One thing this form component does not handle is form validation. In a future example, we will demonstrate how certain fields can be required, while others are optional. This form will submit any fields that are filled, while omitting any that are not. If a form is handled expecting fields that aren’t submitted, then the submission will simply be ignored. // When used in a bind or commit. lookup creates a record with the give attribute and value. We use it here to create a record with the attribute as the field name.